You use QR codes for different purposes. With QR codes you scan pricing, you make payments you get access to something as well as with QR codes you can install some app too on your phone. Is to possible to track how many people are scanning your QR code that you have placed on different places? Yes, with Google Analytics, you can track the sources where people scan the QR codes and get access to your app or some website link. Let’s say, you are using QR codes on leaflets, flyers, business cards and other materials. With scanning of these QR codes, people can install app or get access to some website link. Now you want to track whether they’re coming from leaflets, flyers or some other pamphlets. How to do this? Here is the step-by-step guide to set up QR code tracking in Google Analytics and keep record of how many people scan and visit the link embedded in the code. Organise all the data in the spreadsheet. List all the sources of QR codes in the spreadsheet and list all the respective UTM URLs against them with method explained below. Smart phone together with a QR reader allows the consumer to scan the barcode and have the URL instantly loaded in their browser. QR code readers can be downloaded free and installed on a phone or tablet. Step 1:Set up Google Analytics account and configure it for your top level domain (TLD). This top level domain can be your website or mobile app. Step 2: Use Google Analytics URL builder to create UTM url for the link where you redirect after scanning of QR code. For example, you scan the QR code then redirect to the link for installation. Create custom campaigns inside your Analytics to find out who clicks (scans) each URL. Once you have entered the link in the Google Analytics URL builder (and clicked submit) it will provide a very long URL with number of string parameters in it. This generated URL is too long. Such URLs look ugly as well as they are not reliable and often tend to damage. This often makes it problematic for scanning. 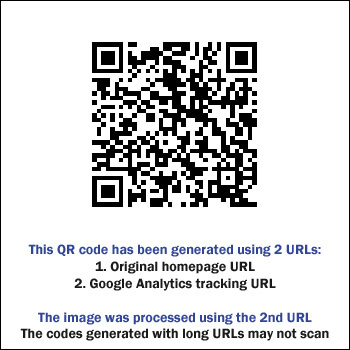 With such long tracking data and raw string variables in the URL generated by Analytics URL builder tool, resulting QR code looks like it is printed on a paper. See image below. 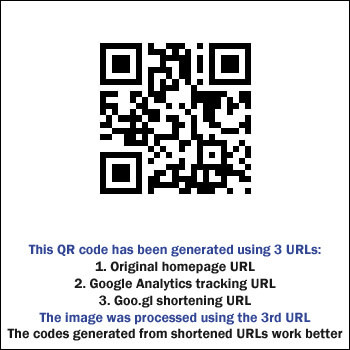 Step 3: Shorten this long URL so you can create an attractive QR code. I advice to shorten the URLs because of long URL disadvantages mentioned in step 2. Always generate QR codes from a short URL. To shorten it with the Google URL shortener. You will need a free Google account to use this service. The QR code will generate as smaller, simpler graphic. It is more reliable and easily scannable even if the code gets ripped or weather damaged. Note: Only existing users can use services from Google URL shortener. Because from March 30, 2018, Google have turned down support for goo.gl URL shortener. You can also use bitly to shorten the URLs. Shorten your long Analytics URL and copy the short URL. To create QR codes, use YouScan.me or qrstuff.com where you can able to generate high resolution QR codes. 2. Choose the radio button labeled “Website URL” in Step 1: Data Type. 3. Paste the short URL you copied in Step 3. 4. What color would you like your QR code to be? Select it here. 5. Click “Download QR Code” and save the file to your computer. Carefully choose a good name for the file, that will make it easy to identify later. You can also print these QR codes and use for advertising banners, on pamphlets, stickers etc. This method of bridges the gap between offline experiences and the online sales platform. You may be driving targeted traffic from a remote location to a checkout ordering process, or sending someone from a business card to a YouTube video or from some banner to app installation link. But whatever you do must be tracked. 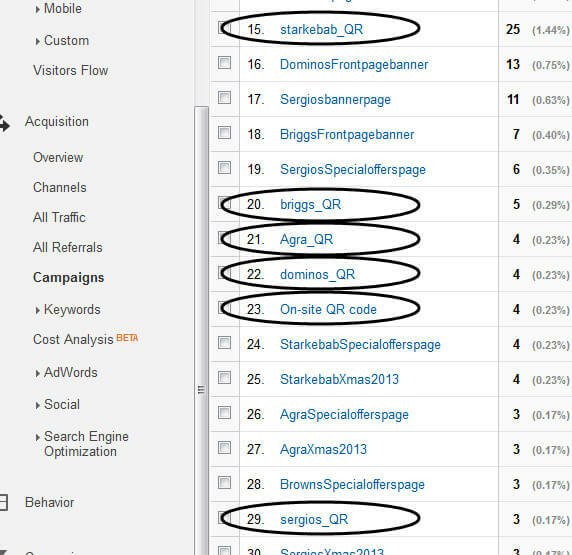 Google Analytics with above method do this for you.